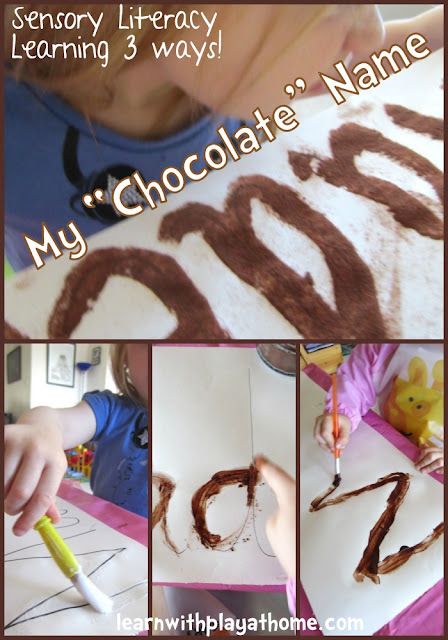 Learn with Play at Home: Simple "Chocolate" Paint. Fun Sensory Literacy Learning 3 ways. Simple "Chocolate" Paint. Fun Sensory Literacy Learning 3 ways. To help my daughter (aged 4) practice writing her name, I thought I'd give her a fun sensory experience to entice her to want to learn. It was a huge success and one of the few activities she has pleaded with me on more than one occasion, to repeat. As a result, I changed the experience slightly each time so now we can share with you, 3 different ways that you could make your "Chocolate" Name! 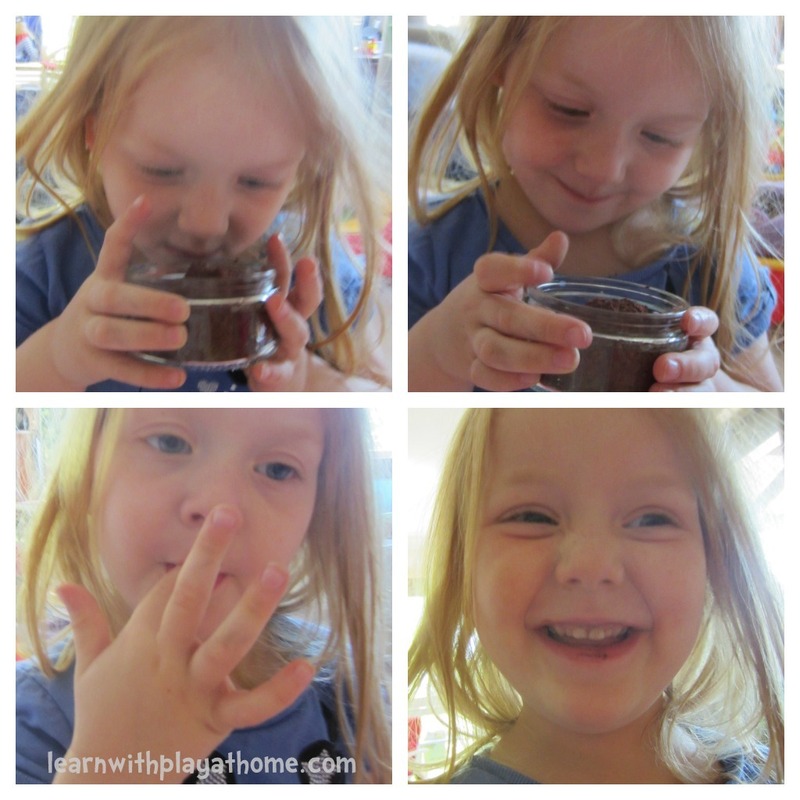 If you're working with kids and cocoa then you have to let them experience it. What does it smell like? "Mmmmm." What do you think it will taste like? "ewww! haha"
She found it quite funny that it wasn't as expected. And it smelt even better! This was a fun process that my daughter enjoyed. 1st the child dips their finger in the water and then in the cocoa. She then finger painted using the repeated dipping process over the written letters of her name. The end result wasn't as dramatic as the first way but it was thoroughly enjoyed. This time we mixed a small amount of water with cocoa to make a "chocolate paint"
On this 3rd experience with the activity, I did not write her name on the paper first to be traced. After practicing she was confident to attempt this writing on her own. We found that when all 3 ways dried, they didn't flake off and stayed on the paper well. To ensure this you could add a small amount of glue to the "chocolate paint" mixture or spray with hairspray when finished. This was unnecessary for us. After writing practice, it's fun to just have free play and experiment with the materials. Chocolatey finger painting was fun! - Simplify this activity by allowing your child to try single letters. The first letter of their name is a good place to start. The 3rd way ("chocolate paint") would be most suitable for younger children. 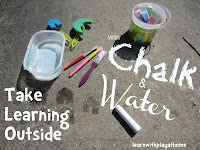 - Extend this activity by having your child write their name without tracing over the letters. Even figuring out spacing and sizing on various different sized papers will have them thinking and learning. You could also use any of the 3 ways for writing spelling words, practicing maths concepts.. anything involving writing really. This is great! I remember we sometimes got to practice our spelling words in chocolate syrup. We each got waxed paper covered in syrup and we'd write the words out in the puddle. Pinning this. This is brilliant. My chocoholic will love it! Pinning.